Blessed by God and nature, the scenic island of Patmos is surrounded by the vast Aegean Sea allowing guests to feast their eyes on blue sky and crystal clear sea waters. If you are looking for a relaxing holiday in a place where you can unwind body and mind, then book your summer stay in one of the luxurious Aegean Suites of Patmos Aktis. Featuring a minimal decoration with natural colors and comfortable furniture, Aegean Suites at Patmos Aktis offer comfortable accommodation surrounded by unspoiled nature. However, apart from its top-notch amenities, these properties also boast exceptional outdoor areas, such as a furnished terrace overlooking the award winning bay of Groikos and the landmark islet of Tragonisi, which protects the calm bay from rough sea. Imagine waking up to this striking view every morning during your holiday. Wouldn't it be wonderful? 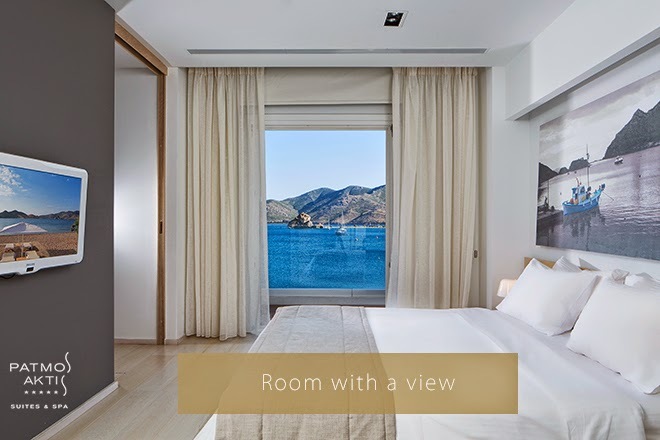 The sea in these suites is visible from every corner, even from your sumptuous double bed. For a more private getaway, opt for one of our Pool Suites, opening out to an ample pool area equipped with sun loungers where you can lie and soak up that all important Greek sunshine with your beloved one. The neutral colors characterizing the indoor spaces blend perfectly with the turquoise pool waters creating an atmosphere of calmness. Blue is all around Patmos Aktis, wherever you look you'll see either the clear sky or the mesmerizing Aegean Sea, so get ready and relax your eyes into the blue in Patmos this summer!